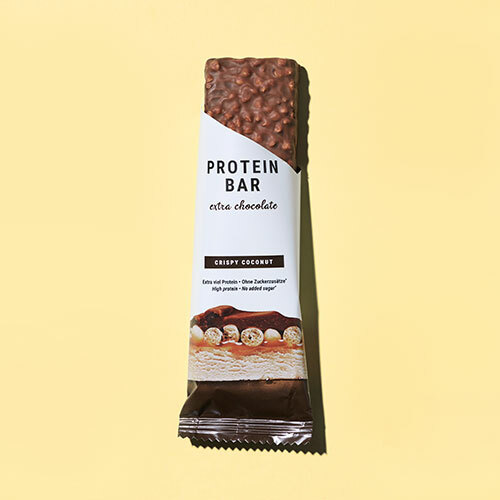 Extra Chocolate Protein Bar | Real chocolate bar. But 90% less sugar. Crunchy peanuts, crispy coconut flakes, or velvety caramel, all drenched in melt-in-your-mouth whole milk chocolate. Totally free of all added sugars. Just as tasty as your favourite chocolate bar, but 90% less sugar and only half the carbs. Fewer empty calories for you. More protein for your muscles. We toiled and tried and tested, and just when we were about to give up, we found the perfect recipe: low-calorie, sweetened cocoa, crispy coconut flakes, soft, velvety caramel, and protein crispies for that extra crunch. And no added sugar. And only a fraction of the calories. ** It's practically perfect. Protein Bar Extra Chocolate will be back in stock shortly.